Normally we just plot the monthly anomalies (with respect to each month), but here I used the estimates of the seasonal cycle in temperature from MERRA2 to enhance the analysis so that months can be compared in an absolute sense. This string of record-breaking months is coming to a close now that El Niño has faded, but it is sufficient to give a very high likelihood that 2016 will be a record warm year in the surface records. On the GISTEMP anomaly graph including seasonal cycles, I find the 2015-2016 jump in the winter lows to be the most startling detail. Aside from increased spread of pests like Aedes aegypti (and associated diseases) toward the poles, I think the cryosphere is going to disappear faster than anyone expects. Gavin, Thanks for all you do and have done! Agree that we should not be having this “conversation” any longer, but as you know, one U.S. political party is denying climate change. The average of the most recent 12 months, Aug-July, was 1C above the GISS baseline (1951-1980). This was also the case for the twelvemonth July-Jun. Quite a milestone. Roberts is a silly fool and Cox is an arrogant pr*ck. So what’s the point? The real problem is not whether NASA (the people who want to colonize Mars) falsified the data, but the lack of meaningful correlation in the data as it stands. Interesting that the audience is in such a good mood, since obviously they’ve managed to convince themselves that the END is NIGH. The politician cites Steve Goddard (wonder if he knows that is not the execrable blogger’s real name?) who was banned from posting articles at WUWT for spouting nonsense. Mistakes US for global temps. His talking points are 9 years out of date. The GWPF lined up Pielke et al, called for submissions, announced terms of reference etc. About three months later, after deadline for submissions, they announced there would be no report. Nothing has been heard of them since. As an Australian, I watched the episode live. It was always going to be interesting to see the brand new senator-elect and the outspoken particle physicist. But Brian cox acted and spoke more like a politician activist than scientist. 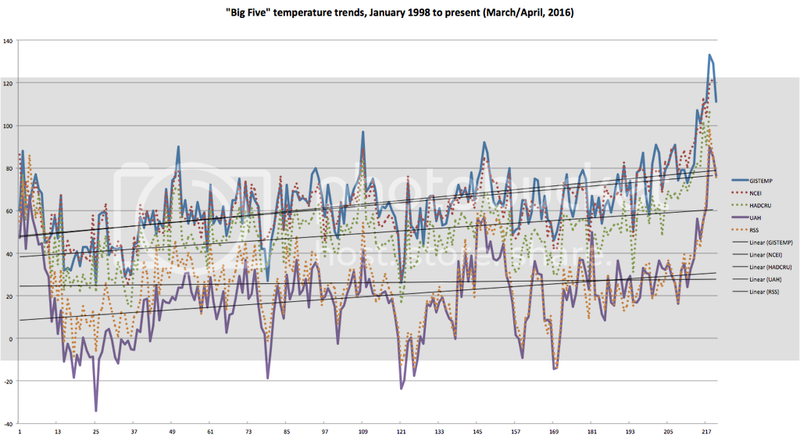 The question from the audience was along the lines of “the senator has asked for empirical proof that humans are largely responsible for recent warming, will someone give it to him” and Dr Cox’s response was to wave around a smoothed GISTEMP LOTI graph? And then we were asked to somehow correlate that to the ice core CO2 record? Sure the Senator-elect may have been laughed at and ridiculed, but it is the particle physicist who should be embarrassed. Hi Gavin, great to see you making a special article about this and your Twitter contributions. Good stuff. Great co-incidence with the hottest month ever update. Q&A is a very credible program, often becomes Twitters #1 topic, and it also usually drives the news cycle sometimes for weeks. Q&A also has a global following at times. I hope one day you could find an excuse to visit Australia on nasa business. Let Q&A know because there’s a seat waiting there for you. The likes of Roberts won’t be going away anytime soon. As shown by the studio audience/twitter response far more people want to hear more people like Cox and yourself take on these foolish deniers who have or gain a “public voice” unfairly. “The 10,000 year Explosion” by Greg Cochran: Human evolution is happening at an exponential rate. So a “newly-elected politician who is known for his somewhat fringe climate ‘contrarian’ views” may have a very low ability in math. Such people may be screened out [win the Darwin award] in the next flood. The print is getting too fine co check, here. Apologies for the vagaries of what Australia’s electoral system has thrown up. A minor (and unpleasant) party gets a few votes and unfortunately a serious troll scrapes in. It is going to be an interesting few years. Brian Cox did well, but the best moment was his reaction to the NASA/Fraud allegation. Just the look on his face – priceless. Very nice. Sadly, not exactly funny since the guy is not interested in the truth, only finding a way (Goddard, forsooth) to call it a lie. Masters at Wunderground has put out an article on the current storm in the Arctic, which may or may not break up the ice; in one animation there were large swathes of water at the north pole, but it will have to clear up before we can see. Meanwhile, our Louisiana floods have sparked a NYT discussion about global warming, front page no less. I discovered I’d gotten ahead of reality on attribution and had to back off a bit. It’s a good effort (also, as always, Andrew Freedman at Mashable did a good job with it). If you can’t convince them – which is obviously the case – sideline them. Go the next step from sensational reports about this hurricane or that temperature record or the other draught. Focus on a global cap on emissions, going down with time, and local and regional caps as steps to achieve it. Make it a topic for political representatives and the media. Australia does have them – remember Maurice Newman? His climate conspiracies were too frequently published in The Australian as opinion pieces. They were just as nonsensical, but in the mainstream media they didn’t provoke the scorn and ridicule that Malcolm Roberts’ nuttiness has, so maybe there is a turnaround happening in the media. Was it deliberate that the ABC chose to expose Malcolm Roberts’ wacky notions during Science Week? Was it false balance or did they think that a clown would be good entertainment? I know some scientists took it as a slap in the face. Others thought it was a good thing, and might make some of the less extreme deniers think twice. From what I can tell, it’s becoming less fashionable to be a denier. I’ve been with some people lately who are leaders in the farming sector, and they either say they are concerned or very concerned about climate change, or nothing at all on the subject. If there are science deniers among them, they are keeping quiet – which is a good sign. It’s true of UAH as well as RSS. V 4: The real problem is . . . the lack of meaningful correlation in the data as it stands. BPL: Okay, Victor, I’m going to teach you what “correlation” means. The Pearson product-moment correlation coefficient was invented by the statistician Karl Pearson in the late nineteenth century. It measures the degree of linear association between two variables. Call them X and Y. Here are the steps to finding the correlation coefficient. 1. Add up all the measurements for each variable. These are sum(x) and sum(y). 2. Divide the sums by the number of points to find the average values. These are mean(x) and mean(y). This is the correlation coefficient, or “Pearson’s r.” Its value can range from -1 to 1. A value of 1 indicates perfect positive correlation — Y goes up in lockstep with X. A value of -1 indicates perfect negative correlation — Y goes up as much as X goes down, and vice versa. A value of 0 means no linear correlation, though there may still be a non-linear one. It is important to note that, to bring out a correlation in noisy data, you want as large a sample size as possible. Let’s start out with the most recent ten years (for this sample, 2005-2014). r between dT and year is -0.2462.
where N is the number of points (here, N = 10), and r, of course, is the correlation coefficient. Our example above yields t = 2.918. According to t-tables (or the highly complex math to derive t-tables), this gives p < 0.01935, which means we can be more than 98% confident in the result. The correlation is "significant at the 98% level." Note that the bigger the sample size, for a true correlation, the higher the confidence level. (In technical terms, p is the probability the result is due to random chance.) The fact that the last three p values above are identical merely means that the p-value calculator I'm using can't handle smaller values. You're welcome to run the numbers through R or Gretl to see what the actual p-values are. So in short, Victor, there is an extremely strong correlation between elapsed time and temperature. Stop saying there is not. You're wrong. Period. Hi Sou! Good to see you here! Thanks for all you do over at HW and of course, thanks as usual to Gavin and crew! I would have thought that’s exactly how a scientist might respond – lots of technical detail that most people probably had trouble following. As opposed to a politician (like Roberts) who just spout empty rhetoric that sounds good to people who don’t understand the issue. Politicians like Roberts are so successful because the technical detail just goes over most people’s heads. Re #4, Your so amusing Victor. As bad as a the politician by the looks of it. Fancy calling Cox that, how insulting. Dr. Schmidt’s tweets will be much appreciated by climate scientists and others who are already well-informed and already convinced that global warming is a problem. They will be completely lost on the audience that Malcolm Roberts is addressing — particularly since that audience already “knows” that all NASA climate scientists are lying, because Malcolm Roberts told them so. And they will have no effect whatsoever on Malcolm Roberts, who is already well aware that he is spouting lies and nonsense, because he is doing so very deliberately. Uh, Weaktor, do you realize what correlation is? Have you ever regressed yearly anomaly vs. ln[CO2]? Because when I do, I get R^2>0.89 through 2015. Do you know what that means? 4 Victor, the dodo went extinct. It’s good to know your moment too will come too you stupid ignorant arrogant pr*ck! Nope. The empirical evidence is out there and has been for years. It is not hidden. I’m not sure why other aussies are apologising (besides good humour). It’s a good thing when fools are exposed for being fools. That’s what the ABC and Q&A often do. Putting Roberts on Q&A for their Science Week episode was a smart move. Do you any evidence for that claim SA? I have seen none. The last decade suggests Roberts honestly believes what he says. He is not deliberately lying. You may label him delusional or a rank idiot of course, plus that he is spreading lies and disinformation but that doesn’t make him a ‘liar’ per se. The same goes for Victor, Titus and most others. It’s farther up the food chain where you will find the deliberate liars imo. The best evidence for human’s causing climate crisis is the CO2 and CO2e record, for only human behaviors emit the pollution that’s increased those concentrations. Do bats drive automobiles or fly airplanes? What rhinos invade other nations with the armies they created–the #1 planetary polluter is the Outlaw US Empire’s military. I have a hard time believing such people are as stupid as they portray themselves. Are they a different species? Roberts is a silly fool and Cox is an arrogant pr*ck. So what’s the point? The point, of course, is that you are both. Victor is a classic case of the Dunning-Kruger effect in action: incompetent people recognize neither their own incompetence nor the competence of truly competent people. He puts me in mind of a mentally defective ten-year-old arguing with a university professor about quantum mechanics. Indeed, he has already been told off by the “professor” — Gavin Schmidt no less — but still he persists with his ludicrous and insulting comments. One wonders at the forbearance of the moderators, but perhaps they’re interested to see how the rest of us deal with him — possibly because they’re faced with the same problem in their professional lives. ad915e52-83f9-4235-9889-c5b008882255.flv that is unplayable on 99% of people’s computers. Better to throw it up on youtube or similar. thx. If you think “a graph” is being presented as ’empirical proof’ for anything then you are the person not worth discussing anything with. What is wrong with you people? A graph is a “representation” of something else … so is a Polaroid photo Woollard, it’s not really you in those photos of you, you know? It’s the science, the laws of physics and chemistry, the data, the observations that are the empirical proof. Only a fool would deny that and not know the difference between that and a graph in the first place. AJ: Louisiana is about 50,000 miles2. The world is 200,000,000 miles2. That’s 4,000 Louisianas. 8 incidents per 15 months * 4,000 areas vs 1 per 500 area-years seems to indicate that such incidents have dropped by 20%. Maybe they excluded oceans? Maybe 50,000mi2 isn’t “their” definition of “area”? Maybe the storm area they included was bigger than Louisiana? You’d think they’d actually explain what they mean instead of just spouting math that indicates strong storms have declined. If I were a denier, I’d scream, “NOAA PROCLAIMS STRONG STORMS HAVE DECLINED 20%!”, and I’d have the evidence to “prove” it. coastal areas burned by wildfires, loss of life, and property…. SecularAnimist: They will be completely lost on the audience that Malcolm Roberts is addressing — particularly since that audience already “knows” that all NASA climate scientists are lying, because Malcolm Roberts told them so. AJ: That sounds actionable, especially by James Hansen. (Since Roberts specifically called him out) A lawsuit for defamation seems to be a very productive response. Gavin, when he’s talking about fraud, he’s surely referring to the adjustments made to account for changes in equipment, siting, and everything else. He’s upset because you’re trying to do your job intelligently when you should just pay some middle-schoolers to read old thermometers nailed to the sides of barns… You’d save tons of money and avoid all that evil fraud which defines your current day! Heck, you could generally just stay home and watch TV! It’s a pity that someone (Brian Cox?) did not pull up Roberts on his erroneous claim concerning recent sea-level rise. I did a double-take on this, as Brian Cox had earlier noted an actual figure on sea-level rise. That figure, of course, corresponds to about 3 mm/yr. Is this what the WUWT folk meant when they opined that Roberts “owned” Cox? “We’ve had a pause in this so-called warming for now 21 years, depends how you measure it, 21 years. Cox has probably *less than a minute on live television* to refute Roberts’ cherry-picking of The Pause. I think most people would agree that producing that graph was a clever way to illustrate the empirical evidence given the limited amount of time he had to respond, and the largely non-technical audience. It is true that in the satellite data the annual mean for 2015 does not surpass the value for ’98, but that is because ’15 does not correspond to ’98 in terms of the effects of the respective El Nino cycles. But ’16 does. And as noted above by Gavin, ’16 is well on track to surpass ’98. Got a graph on that, too, though it’s a month or two behind, and I don’t have time just now to update it. That’s about to be the record showing the lowest trend, once RSS implements their newly-corrected algorithm in the TLT product. Nice straw man argument Keith but before there can be any agreement about the cause of global warming there first needs to be agreement that there is substantial global warming. Roberts hasn’t reached the latter. Doesn’t look like you’re interested in discussing the point anyway. re #17, #22, etc. There is a huge difference between the uncritical application of statistical methods and the understanding of basic scientific principles. A great many climate scientists acknowledge the difficulty I’ve raised, and their response is based on their analysis of the various forcings affecting global temperatures, NOT the simplistic juggling of arcane statistical formulae. A case in point is the very interesting summary of the problem as presented by John Cook in his Skeptical Science blog (see http://www.skepticalscience.com/The-CO2-Temperature-correlation-over-the-20th-Century.html). While Cook is not a climate scientist, he does have a decent understanding of scientific principals and many of his posts are based on his thorough knowledge of the literature. As should be clear from his presentation, he takes the issue of long term correlation very seriously and attempts to deal with it in a meaningful scientific manner, not by producing statistical artefacts. I don’t completely agree with his analysis, but that’s another matter. I am continually surprised at how difficult it is for certain individuals posting here to grasp even the simplest and most straightforward scientific principles. At one time I assumed most of you were scientists, or at least competent technicians in some field or other. But now I seriously wonder where you’re coming from. What gives you away as rank amateurs is the extreme defensiveness and bad manners, which should have no place in a blog supposedly devoted to scientific issues. Depends on your definition of liar. Asserting something IS true when you don’t know whether it is or isn’t is deceptive. Deception is a type of lie. You’re absolutely right. Satellites don’t measure surface temperature. They’re just radio receivers. don’t feed the trolls, it just encourages them. Hmmm, struggling a bit with the notion of empirically-derived data and how they can be used to attribute the forcings on global temperature, aren’t you? And it doesn’t change the fundamental fact that human emissions of CO₂ are almost certainly responsible for more than 100% of the observed warming, once the effect of aerosols is accounted for. I’d say hold up a GISS graph by way of summary is emminently suitable for the medium in which it was presented. Your impossible standards may vary. If you think a graph of GISTEMP since 1880 is in any way empirical proof that there is a human component to the increasing global temperature then there is no point discussing further. 1) CO2 traps heat radiating away from the Earth’s surface. 2) CO2 in the atmosphere has increased from 315 ppm to just over 400 ppm since 1960. Given 1 and 2, it would be astonishing if the global mean surface temperature of the Earth had not increased. GMST has in fact increased, by about 0.7 degrees C since 1960. 3a) The increase in the atmosphere is about half the amount that has been released by burning fossil fuels in that time. The rest has been absorbed by the oceans, the biosphere and the crust of the Earth. Net absorption means that the oceans, biosphere and crust are sinks, not sources, of CO2. 3b) Analysis of carbon-isotope ratios shows that the additional carbon in the atmosphere is fossil carbon. 4) All known “natural” factors affecting GMST over the time period have had a net cooling effect. Together, items 1-4 are sufficient to convince a lopsided majority of trained scientists who’ve published on the topic that the warming since 1960 is anthropogenic. At this point, counter-claims qualify as extraordinary, and extraordinary claims require extraordinary evidence. No such evidence has been produced. If that’s not sufficient to convince Malcolm Roberts, or you, then there really is no point in discussing it further. Persecuting climate scientists is not harmless. I forget where I picked that up, but like our Rep. Lamar Smith and Judicial Watch, his efforts to shut down science for his fossil buddies are the further possible thing from harmless.